Halloween is fast approaching and junk food is filling up the stores shelves. As a kids yoga advocate I’m always looking for healthy yoga alternatives to reduce the amount of junk food kids are fed. Here are a couple of ideas you may find helpful if you are celebrating Halloween with kids or just for to get your children to do yoga. This Kids Yoga colouring page that I handed out with treats a few years ago was a hit. The free PDF is at this link including a video of how I used the pages on Halloween. This year I’m going to go a step further with a new treat for the little monsters and princesses that slink up my step: Yoga Stickers! The stickers are a new resource included in the Yoga Literacy – Kids Yoga Teacher Certification. I got them about a month ago because new kids yoga teacher graduates were asking for stickers. 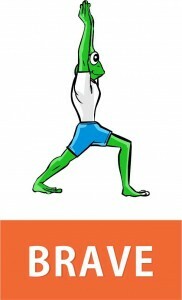 The Frog Yoga pictures are cute images for stickers and there are a lot of fun things to do with them in yoga classes with children. Space Markers: if you don’t have yoga mats for each child, you can stick the stickers on the floor, a blanket or pillow (just don’t stick them on your fancy ones – they are stickers after all). You could also cut up a Yoga Mat in to circles or squares and place a sticker in the centre of the circle. This lets your class move around doing Yoga poses and then come back and sit on a sticker when you want to get everyone settled down. Crafty Yoga Projects: Stickers are an easy way to decorate things like bookmarks, jars, or cans. They are already sticky which saves the mess that comes with gluing things. Marvelous Motivation: Those who utilize ABA (Applied Behavior Analysis) methods know that positive reinforcement can be very effective. Stickers work like awards and can be extremely motivating for some children. I’ve seen kids who will do an hour of yoga to get a sticker award at the end of class. They’re a nice alternative from reinforcing positive behavior with candy. Sometimes kids will save their unused stickers and trade them in for a larger prize. Lesson Themes: Calm, Brave, Steady, and Strong are the words on these stickers (see the images of the stickers on the side). They can prompt wonderful heart to heart discussions. What do these words mean to you? What yoga poses help you feel this way? What else can you do to feel this way? The stickers are like having a four week lesson plan in your pocket. Just Give them Out! Its fun to just give the kids stickers, not as a reward, not as an exchange, not for any other reason than to give. Whether its Halloween or not, Yoga Stickers are great treats. If you are interested in kids Yoga Stickers, you can get them with the Yoga Literacy Kids Yoga Training Certification. Stickers and many other really useful tools are included (see the picture below). Its a wonderful weekend Kids Yoga Teacher Certification in Yoga Literacy. You can see all the details are at this link. It is worth the trip to Toronto! You get a Certificate for the weekend training that also counts toward Certification with a Yoga Alliance Registered Children’s Yoga School (95 Hour Required Training). You can also order yoga stickers and have them shipped to you to use with your kids (or your playful adults). Visit our store at this link. Please share any sticker ideas you have for kids yoga in the comments. Will you be doing anything special with your kids for Halloween. Let us know.